Amidst all the post-earthquake we-told-you-so of prophecies fulfilled, there is one stark and brutal truth: this country was already a disaster zone even before disaster struck last month. And nowhere was that more evident than in agriculture. Eighty per cent of Nepal’s people rely primarily on farming for livelihood: agriculture contributes 40 per cent of the GDP, yet the farming sector had either been neglected, or ruined by flawed policies. Allocation for agriculture in the annual budget had fallen to less than 3.8 per cent – and most of that was not earmarked to boost production but to subsidise consumption. Most alarmingly, the state’s investment in the Agricultural GDP (AGDP) has been consistently below 2 per cent since the end of the conflict, a period when farming should have sprung back to reap the peace dividend. Experts we consulted said a country needs an optimum of at least 10 per cent investment in AGDP in order to meet the demand of a growing population. 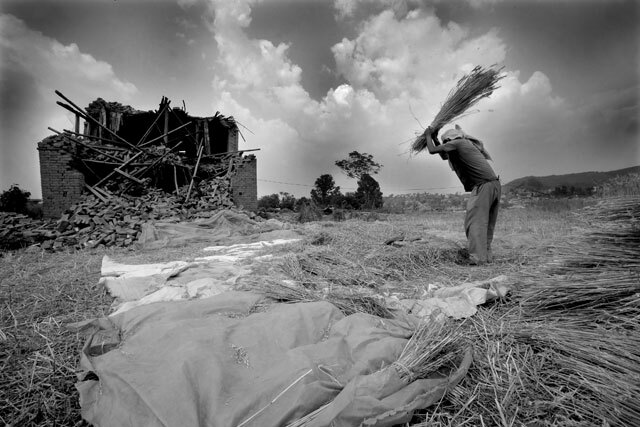 Agriculture in Nepal was already broken, it needed to be fixed even before the earthquake. Young people were moving out of the land, private and public investment in farming was falling, urban expansion was reducing the total cultivated area, there was fragmentation of landholdings, irrigation was never given the priority it needed, productivity was plummeting. And on top of all that, erratic monsoon and extreme weather events caused by global climate change was starting to make all those prevailing problems worse. In a country where 85 per cent of farmers still depend on subsistence rain-fed agriculture, Nepal was already in crisis. Then came the earthquake. The government’s reaction in the past month has been marked by one dominant feature: a singular lack of a sense of urgency. For a calamity of this scale and scope, we needed leadership that would already be on its mark, getting set, and ready to go. Here, one month later, we are just beginning to see a creaky state machinery trying to organise itself for relief delivery. It’s like the PMO is swimming in honey, the bureaucracy camping out in tents take ages to decide anything and when it does the decisions are ill-considered and ad hoc. Instead of rushing relief supplies through customs, officials find excuses every step of the way to delay clearances. Most government pronouncements have been counterintuitive and counterproductive (Prime Minister Relief Fund asking rescuers to leave prematurely, customs duty on relief goods, a ban on new houses when shelter is the prime need) or have been deadly blunders (the Army brass refusing to allow RAF Chinook heavy-lift helicopters to punish the UK government for the arrest of Col Kumar Lama). To be sure, we have seen some bright spots in the Ministry of Health, district hospitals, the role played by state broadcasters in disseminating accurate information and refuting rumours, the urgency displayed by security forces in search, rescue and relief. However, just when it should have sprung into action, the Ministry of Agriculture is in deep slumber. Emergency food aid has been handled reasonably well by first responders, including some local administrations, UN agencies like the World Food Programme, charities, communities and individuals. But relief now needs to change gears from distributing food to rehabilitating agriculture. With the rain only three weeks away, the government apparatus should already be in crisis mode to rush seeds, fertiliser, and tilling tools to farmers who have lost all. As agro-economist Hari Dahal tells us livelihoods have been disrupted and we need to quickly restore the capacity of families to get back on their feet. Fortunately, our reporters have seen encouraging signs that even families who are in mourning and have lost homes and livestock are harvesting potatoes and millet, watering their vegetable patches and getting ready to plant paddy. Others have managed to dig into the ruins of their homes and salvage seeds, which they can now plant. There are millions of the neediest, hardest-hit villages which will need emergency food aid for the coming year, others will need help to go back to the land. In the medium term, as one expert told us, the strategy “should not be to give fish, but to distribute nets”. The mistakes of the Karnali should not be repeated to create crippling dependency among farmers for perpetual food aid. Cash for work, rather than food for work would revitalise markets and spur local production. Let’s have a target of encouraging at least 200,000 Nepali youth from the Gulf and Malaysia to return to their home districts and provide minimum salaried employment in rebuilding homes, infrastructure and reviving agriculture. This is beginning to happen at the individual level, but it needs a strategy and a systematic implementation plan from Singha Darbar. Since the 15 hardest hit districts are not food surplus areas of the country, the overall impact on the macro-economy will not be as serious. However, Dhading, Nuwakot, Dolakha and Sindhupalchok are major vegetable producing districts and supply most of Kathmandu’s needs. Kavre has emerged as a dairy hub, but thousands of buffaloes and cows have been killed or injured in the quakes. The El Nino effect is supposed to delay the monsoon this year and precipitation is forecast to be 60 per cent below normal in Central Nepal. This will reduce the impact of landslides, but is going to hit productivity, especially of subsistence farmers without irrigation. The mountains of central Nepal are unstable after all the shaking, and the monsoon this year is bound to trigger deadly landslides causing more destruction and blocking highways yet again. Access to markets for cash crops will be disrupted. This crisis offers us a window of opportunity to fix the structural problems of Nepal’s agriculture. We must move away from government support for the current inequitable emphasis on private commercial farming to investment in livelihood improvement so that the most underserved families can finally grow enough food to last them at least 12 months in a year. Doing that will reduce the push factors of out-migration, keep the workforce at home, and in turn boost productivity. Our aim should be to revamp agriculture in the earthquake-affected districts so that they become role models for self-sufficient and sustainable agriculture for the rest of the country. How will the government fund the elections?